I could say that there are never going to be sufficient books to fill the voracious maw that is me. Get writing! I need books! If I didn’t re-read I’d run out of books eventually and that would be terrible! 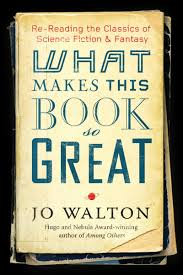 Jo Walton is a prodigious (re)reader. It was her devotion to books that landed her a gig as a blogger at her publisher Tor.com, where she blogs about re-reading. This book is a selection of those blog posts. I love this idea for all kinds of reasons, but most especially because it puts fans in touch with books tried and true. It’s not all about the latest thing, but about books that have enduring appeal or that deserve a revival or that need their praises sung. Singing praises is something Walton does well and very persuasively. There’s a wonderful quality of immediacy to her blog posts about her favourite books, which contrasts nicely with what she has to say about their enduring qualities. The majority of posts are about science fiction, there is a fair bit of fantasy, but she also includes some surprising books. In one particularly brilliant piece about Middlemarch, she argues that George Eliot could have invented science fiction. For the bibliophile, there are also several wonderful pieces about the joys of reading, ways to read and re-read, essays on genre and sub-genre, and on how to speak to an author. I do not read science fiction, though since having kids, I have added a lot of fantasy to my reading diet. I’ve tried Ursula le Guin many times, and each time lamented that she just did not speak to me. I think the closest I’ve come to reading science fiction in the last 25 years was Margaret Atwood’s The Blind Assassin. Walton is such a persuasive enthusiast, though, that I’ve added a dozen books to my wish list and TBR pile on the strength of her endorsements. Her expertise is unimpeachable, and her enthusiasm so infectious. When I had only a few pages left of this book, I put it down in order to re-read Among Others. I did so to honour Walton’s own practice, and I am so glad I did. Among Others is almost the novelistic equivalent of this book of recommended reading. The protagonist joins a science fiction book club, and so many of Walton’s favourite titles come into the novel through this thread of finding community and a sense of home in books. Reading one in light of the other gave both a wonderful new richness. Then I read her newest book, My Real Children, and I think it was my first truly cover to cover, do not move, do not pass Go, do not collect $200, gobble of a book. I began at midnight, and I did not move until 4 am when I finished the book and reached over to turn out the light. How wonderful it has been to be immersed in so much bookish goodness. Off now to find her first two books! The only Walton book I’ve read is ‘Farthings’ which I loved. For some reason our library system doesn’t seem to appreciate her. I really must get hold of a copy of this, however, because i love books about reading and books. Thanks for the pointer. Farthings is the second in the Small Change series. Ha’penny, Farthing, Half a Crown. I loved them. I thought Among Others was just excellent. I’m excited for both this and My Real Children — I have holds on them at the library and am waiting very patiently for their arrival. So did I, and if anything I loved it more the second time. Love her enthusiam (and yours)! I was dipping into this nightly until I stumbled on a spoiler for Game of Thrones (I’ve only read/watched season two – behind, yes) so I set it aside temporarily, but I’ll get back to it (when I’ve caught up with GoT). Her urge towards rereading is just wonderful, and it’s good to know that Among Others stands up well on a second run.